Frances Liebenow Armstrong '36 was a strong, determined lady with a tireless work ethic and an everlasting spirit of service. A teacher for more than 45 years, she contributed to the education of generations of Fredericksburg-area students and received numerous accolades and honors. Of her many interests and passions, Mary Washington remained close to her heart. After retiring from teaching, she worked for various campus offices and was lovingly referred to as "Mrs. A." In 1984, she received the first Alumni Association Service Award, now named in her honor. 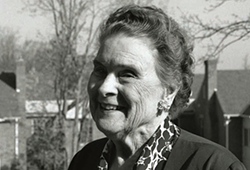 In 1995, she became a member of the Mary Washington Heritage Society. Mrs. Armstrong passed away in 2010, and a bequest through her estate created a scholarship for UMW students pursuing teacher certification. Two UMW students are grateful for Mrs. Armstrong's dedication to her alma mater. As recipients of the Frances Liebenow Armstrong '36 Scholarship, they both plan to teach in the classroom. Connor Pratt '12, M.ED. '13 says the scholarship is an honor that offers tremendous benefits. "It makes me feel that the school and those associated with it care for their own and want to provide opportunities for students in need," she says. "This scholarship has helped me to become a more successful student as I am able to commit more of my time and energy toward study and practical experiences. Since there is not any compensation for student teaching, the help from this scholarship is invaluable." Hannah Kassebaum '13 said the Armstrong Scholarship helped her financially and also makes her feel more connected to Mary Washington. "I didn't have to worry about a portion of my tuition, and that took a huge burden off my shoulders," she says. "I feel as if members of the University acknowledged my studies and activities. Receiving this scholarship made me proud to be an Eagle." Mrs. Armstrong certainly would be proud to know that her legacy continues in the lives of these UMW students — and in the future generations of students they will teach.